Tao is really Nature's way: the order, course of pattern of all things created. Yin and Yang are symbols of the Tao. They are the dynamic force of the Tao, constantly interacting with one another. Success is the sum of preparation and opportunity. In Chinese philosophy, the Tao is the "way" – a path to harmony. remains outside, but is always here. The Tao helps you achieve much more with much less effort. This effortless skill comes from being in accord with reality. You can't tell the singer from the song. You can't tell the dancer from the dance. When you are in harmony with the Tao, when you go with its current of energy, your innate intelligence takes over, and the right action happens by itself. If you think about it, you lose it. This is the purest and most effective form of action that Tao Te Ching calls "not-doing" or "non-action". 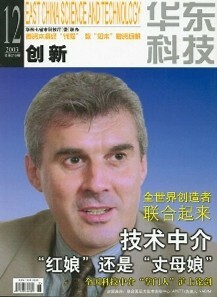 The Tao teaches you the art of living and doing business. The Tao gives you advice that imparts perspective and → balance. It applies equally well to the management of large corporations or the running of a small business, to the governing of a nation or the leading a small team, to your personal development or to the coaching of others. Yin: looking at your business from the outside-in, empathizing with customers, understanding customer → perceptions as well as needs of all stakeholders, and working towards satisfying them. Yang: creating new market niches and customers by inventing new-to-the-world products, mastering radical innovation, venture, → competitive, and → differentiation strategies. to accept conditions as they exist, or accept the responsibility for changing them." 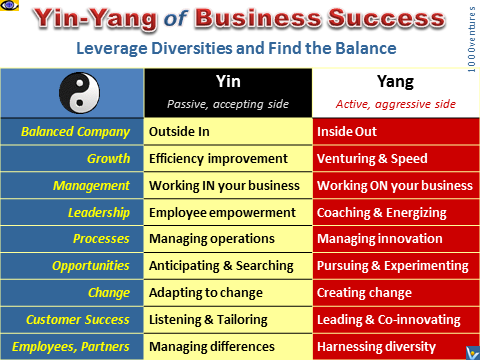 Yin: anticipating change; creating an adaptive organization; and adapting to change.